Learn how to prevent a frozen downspout, or how to manage your already frozen downspouts. Winter is almost here! While snow is beautiful, the cold temperatures, freezing rain, and ice that accompany it can pose water damage and other problems for your home. 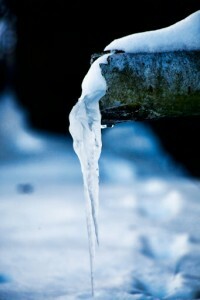 A common problem in winter is freezing downspouts, as debris from fall can block the water flow in your downspout or gutters, causing stagnant water in your pipes to freeze. Here are a few tips when dealing with your frozen downspouts. Of course, if you can prevent a frozen downspout, that is the best course of action. There are a few ways to shrink the chances that your downspouts will freeze: one is to wrap them with heat tape, especially at the elbows of your pipes where there can be stagnant water. You can also run a heat cable inside of your downspout to prevent water from freezing in that way. Heat cables can also be run along your roof, near your gutters, to prevent ice dams from making their way down your downspout. So, your downspout is already frozen. There are a handful of ways to safely clear the ice but do not try using brute force, like hitting your downspout with a baseball bat, to attempt to break up the ice inside. This almost always does more harm than good. To safely clear the ice, check to see if there is a lot of snow around the bottom of your downspout, as sometimes the pipe itself isn’t frozen, the water just can’t escape through the bottom. If you have a lot of snow, just clear it with a shovel. If that doesn’t help and it’s safe to get on a ladder, try pouring warm water down your spout, and that will clear minor ice buildup or break up any blockages. A safer option is to use hot water on the outside of your downspout, either by pouring or spraying with a hose connected to a hot tap. If your pipe is still frozen, you can use a hair dryer or consumer grade heat gun to heat up the outside of your downspout. Start near a blockage if you can locate one, or start near the bottom of the downspout and work upward. Never direct heat directly into the downspout opening, as this can pose an electrocution hazard if the blockage breaks up and water comes rushing out. This entry was posted on Friday, December 15th, 2017	at 5:44 pm	. You can follow any responses to this entry through the RSS 2.0	feed. Both comments and pings are currently closed.